Many of you know about our 1827 Barn and our famous Squash House, but have you ever noticed the small building off the back of the 1827 Barn? It is an old Ice House! 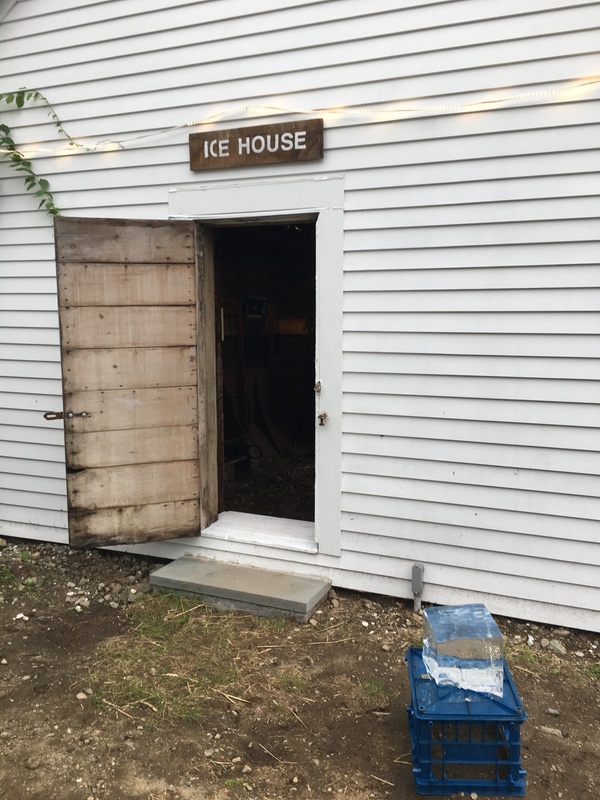 What is an Ice House do you ask? For many of us, the whole booming business of ice harvesting has long left our memories, but this Ice House is a remnant of that time. 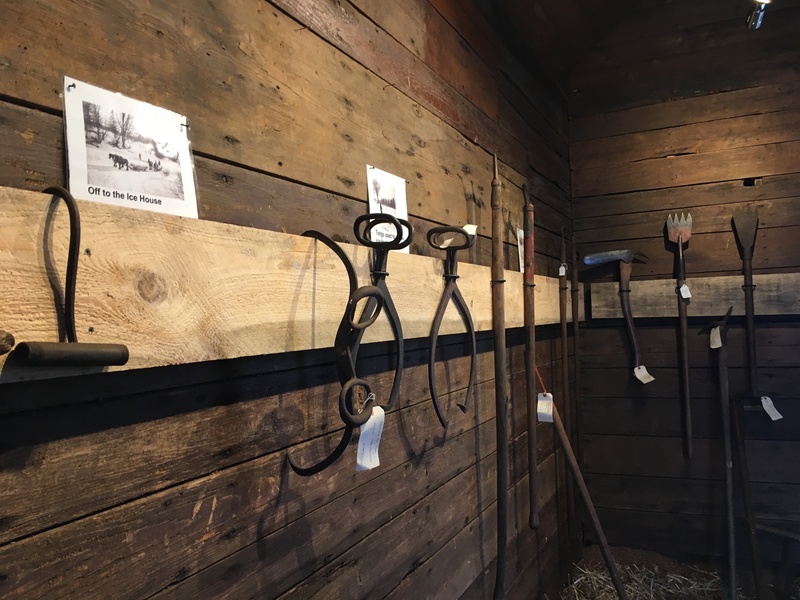 We have recently redone the Ice House as an exhibit so more people can learn about the history of the area and of the farm. Here is some information and to give you some background (courtesy of Michelle Prior, one of our board members). Before the advent of freon-based refrigeration in the early 1900s, ice was the only way to keep things cool and keep food from spoiling. Ice Harvesting – the process of extracting ice from freshwater sources – was a significant business throughout the 1800s. 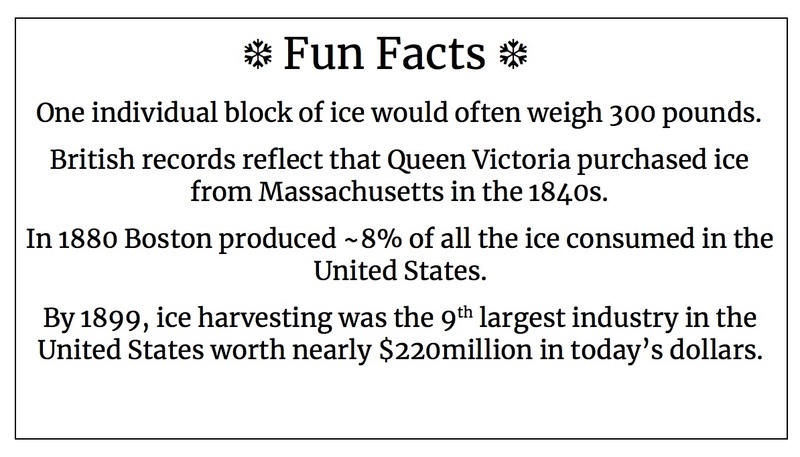 The commercial ice industry can trace its roots to Boston, the first natural ice business began in Boston in 1805. 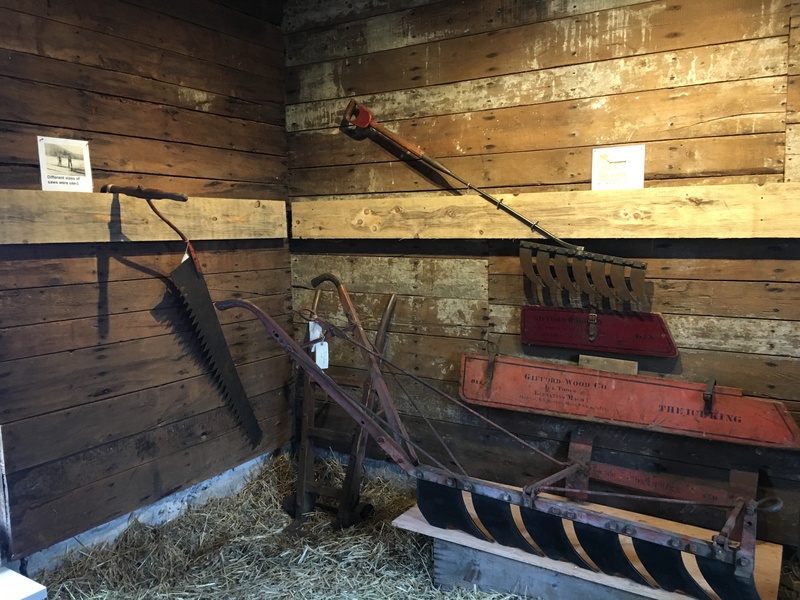 In its heyday, ice was the first agricultural product of the year in New England, harvested in the heart of winter, January & February. Specialized tools were developed to harvest 12-20inch thick ice, and the work was extremely labor intensive. Scrapers were used to clear snow from frozen lakes and ponds and the pond ice was scored into large grids (like a checkerboard) by ice plows. Large custom-made saws were used to cut ice blocks following the outlines of the scored grid. Splitting bars or spades separated the blocks from the larger grid. People working on the edge of the cut sections of ice then used long picks or poles to direct the ice blocks into channels cut into the pond – pushing them along like a floating assembly line. Ice blocks were then lifted into ice houses by conveyor belts powered by animals, machines or humans. Gaffs were used to lift the blocks into place and the ice was tightly packed in rows and columns inside the ice house. Ice was preserved in houses which were specifically built for the purpose of storing harvested ice. Ice houses were double walled and tightly insulated with straw or sawdust. Small ice houses were built by private landowners and commercial ice houses could store as much as 80,000 tons of ice. The ice itself was sold to individuals and businesses and ice harvested in the heart of winter was preserved and sold throughout the year. Ice was often wrapped in blankets before being transported for sale. Ice from New England was sold to customers in the southern United States, in the West Indies, South America, India, China and Europe. In the 1850s the ice box was patented and ice boxes began to appear in homes in greater numbers and families would receive weekly ice deliveries. Ice was used primarily for preserving foods and making ice cream– it was not consumed the way it is today, to chill beverages or be blended into smoothies. Ice harvesting from natural water sources began to decline with the invention of automated ice machines and the widespread expansion of refrigeration. However, ice harvesting is still being done in New Hampshire and Maine and the public can participate in the annual President’s Day weekend harvest at the Thompson Ice House in South Bristol, Maine. Currently we do not of a consistent schedule for the Ice House. 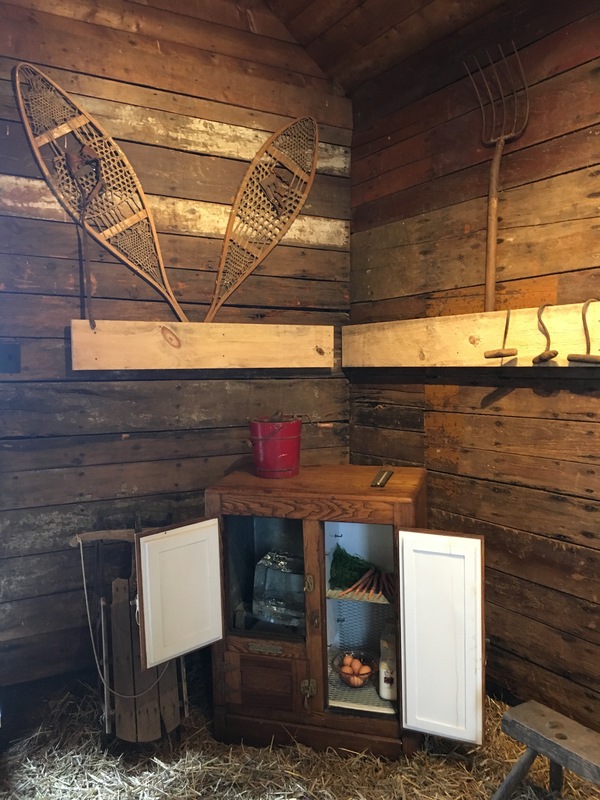 If you would like a tour of the Ice House Exhibit, please contact Archie McIntyre.